My journey with the poor had many beginnings. While an associate staff of the Navigators, I was invited by Viv Grigg to live with him in the slums. It was 1979 in Tatalon, Quezon City, where Viv began what would be the historic start of the incarnational ministry that now spans the entire globe. I think all ministries begin like this, especially difficult ones. It’s called getting your feet wet. I have done this many times already, to get a person started in mission. It really works. But when I was there, I found the work too difficult for me, especially that Viv almost did not eat anything while we were there. I would get home very exhausted at night and fall asleep on the floor without supper and wake up the next day to start the ministry again. We lived in a small cardboard shack, just enough room for a couple of people. Before Tatalon however, I had already began working among the street children in Cubao, Quezon City. While working as a Navigator staff on campus, UP Diliiman, I would do moon lighting from 10 pm to 2 am ministering to the kids on week-ends. It was a really good ministry because so many volunteered to work with us. We met the kids, helped get them cleaned, usually with face cloth and rubbing alcohol because there was hardly any water tap around. The kids rested during that period, a short window to share the gospel so it was the time we went to see them. After they were cleaned, we would give them home cooked food, they were sick of commercial food, no matter how expensive they were. They longed for adobo, ampalaya, mongo, and sinigang. After they ate, we did short discussions about the gospel, some singing and some literacy. Most of them could not read and write. Many of the kids were actually on the street not because they were poor but they run away from their homes because the home was violent, but they had food and other amenities. We worked with the street kids for 6 years and sometimes slept on the street with them, which was really scary. There were no holidays. when i was courting my wife, I had with me 3 of the kids when i visited her in their house. it was a 24/7 job. As time pass, the kids arriving on the streets became younger and younger. One time we even had a 4 year old boy. There were few girls then. The CGM of Action had been doing the ministry for some time and it was from them that we learned how to do it. There was no one working in Cubao so we took that area. I was attracted to them because I always see them knocking on the car windows on the streets. Many looked down on them and suspected they were syndicates so that not many were eager to give them any money. I had to know if they were really poor which was why I began hanging out with them. My goal was to find out where they slept at night, if they had families and if they really were part of a criminal syndicate, used by criminals to get money from the public using these poor kids as pawns. I think the best way to remove our blinders or prejudices against the poor is to get to really know them. In the last 28 years of working among the poor, I can still count on one hand the number of people among the rich who really know the poor. Many have these biases, with some so totally out of this world misconceptions of the poor, that make them suspect the poor and look down on the poor. They think the poor are lazy, or the poor are drunkards. They think the poor will just take advantage of them or the poor are dangerous or ministering to the poor is a total waste of time. They think it is the poor who need them and that they are the ones giving to the poor or doing the poor a favor. I have never felt the stress or trauma of working with the poor or difficulty adjusting to immersing in the slums. It may be because my teen age years were spent among them. We were not poor but my parents were always away and the only friends I could find were our neighbors who were very poor. It was a kid’s natural way of breaking the dividing wall of prejudice. I felt very comfortable with them and considered them my best friends. Of course, the poor here are different from the poor in affluent countries, in Europe and America. There, they are the dregs of society, who cannot keep up with the rapid pace of life in a fast modernizing society. Most of the poor in America for example are alcoholics, suffering from depression, divorced, parolees, drug addicts, or with PTSD. They cannot keep a job or a family. Most of them can be found in food queues in big cities. You will need a PhD in psychology to be able to minister to them. Although with street-kids, you would also need some higher skills sets, but not as high as those required working among the poor in America. I run away from Tatalon after a week. It was so traumatic for me but the disease lingered on, the virus had taken its effect. I was fully contaminated. 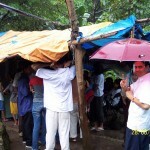 In a few years, I ventured into working with slum families. Working with families I thought offered more chances of success. Our success rate among the street children was very low, almost negligible. It’s the same probably with rehabilitating prostitutes or working with prison inmates. Now, we plant 3 to 4 churches in the slums. all of our churches have a schools and a livelihood project. We find slums that are new, with no church yet, and big enough, not less than 500 houses but not more than 1,000. The community must be very poor. We have a rapid assessment technique: if there are too many sari-sari stores or small shops in the community, it is likely not poor. Stores do not survive unless there are buyers or customers. To buy, they need money and if they have money, it means they have jobs also. Usually, with a 500 house community, there would only be 5 stores that will survive if it is really poor. The exception is a slum community located in a dumpsite. There is so much cash going around daily that stores would proliferate not because the people are rich. In the dumpsite, people spend more than half of their income for healthcare because the dirty environment makes them prone to sickness. Although they may have lots of cash, they also spend so much for medicines and hospitalization. I worked in the dumpsite of Payatas for 11 years. We have toxic waste too, hospital waste and deadly chemicals. sometimes, an entire shipment of diapers from japan are unloaded from the pier direct to the dumpsite. there was one container van of good hersheys chocolate which were deformed when they were left too long in the pier and could no longer be sold and were just thrown away. you could easily notice because every kid in Payatas had hersheys as baon in school that day. We had so much flies in the community one could sometimes no longer see the plants or the trees or the electric wires. We have this joke in the dumpsite. When we began there, we were all die-hard Pentecostals. We sang at the top of our lungs until one of our song leaders swallowed a fly during the service. After that, we all became Baptists. All our communities are now on the outermost limits of the urban centres. There is no longer such a thing as Metro Manila. So many places which are legally and officially outside of Metro Manila now belong to and feel like Metro Manila. Our ministry communities are located in Cavite (Talaba, Longos), Las Pinas (Wawa, Villa Alfonso), Taytay (Arinai, Pacnai), Teresa (Ondoy), Antipolo (Masinag), Montalban (San Isidro, Jovil), Bulacan (San Jose), Valenzuela (Malinta), etc. As we complete our work in a community, some of the people there also join us. Over time, 70% of our staff are now from the slums. We have an open community. The money of the mission is an open book. Also the decision making and leadership structures are open to all members. With 70% or more of them in our mission, you can say, the urban poor own the mission. We also empower our women. The wives of the staff vote during the election of the leadership and board trustees, as equals with their husbands. I think what makes the mission groups of Caucasian-led ministries different is that it is very hard for Filipinos, especially the poor, to penetrate the finances and leadership of these white-controlled mission organization. The the Filipinos are kept at a distance and never really become a part of the mission community as an equal of the whites. Many Filipino mission organizations copy this model, maintaining a very highly capitalistic structure inside: every man for himself, and our money or salary or support is our own. The financial reports are not made open to all the members. In place of the white men are the rich Filipinos. This separation and disparity pushes the poor away. The World Vision had a crisis several years ago when the poorer employees complained against the disparity of salaries and the disgruntled employees filed labor cases against the company. This also happened later to Action International. We don’t want to treat our staff as employees nor run our mission like a typical corporation. We run our mission organization like a community on a spiritual journey. We also apply the Scriptural injunction that he who gathered much did not have too much and he who gathered little did not lack anything. We try to promote a sense of family, each one is a brother or sister, all are equal. We have been growing in number since, adding 5 to 10 new workers each year, despite the fact that we don’t pay salary. There is a book about the incarnational ministry which equate these incarnational missionaries with the olden day friars e.g. the Franciscans. It is a good model but sadly it only applies to the Caucasians or rich missionaries who have elected to live a life, what is called voluntary destitution, living in the slums. I would like to pose a challenge to them, if they can try and get these urban poor workers into their line of sight, and considered them also as new friars for they have long been so even before the first white man immersed himself in the slums. When I was a missionary in China with the Navigators, I only had very little support I could only eat the Chinese made Maling luncheon meat most of my meals. It was then only 16 pesos a can. It lasted me a whole day. I lived in the most Spartan place, away from the big universities in the big cities where the Caucasian missionaries worked. I worked inland, in the remote towns where it was cheaper. Most of our staff here in Manila live in the slums while ministering with us. When they have kids, they don’t go out of the slums and when their kids grow up, they still live in the slums, because they have no choice. They can’t go home like the whites do, who go home to America when they finally get tired of urban poor ministry. Sometimes, our Filipino staff do get to go overseas, e.g. Tokyo, Hong Kong, Berlin, Dubai, etc. but as domestic helpers or construction workers or seamen. If we say 10% of 11 million Filipinos working overseas are Christians, and if 10% of these Christians are sharing the gospel aggressively, that would be about 110,000 missionaries, making it the largest mission force in the history of the Christian church, larger than the Koreans today. But no one would view them as missionaries. They are just elementary graduates, they have never had seminary, nor could they ever be ordained for ministry, even though they have brought about some astounding ministry results. I would say that the house churches of China were what made China today the largest Christian nation in the world and these house churches are all composed of poor Christians. When I met the first batch of scholars from PROC in the seminary here in the Philippines, they were very young and totally amazing. All of them already had planted several churches, and all of them had been imprisoned at least once and been severely persecuted. These are the kind of people we need in mission today. Our mission focuses on recruiting from the slums because the urban poor are more easily mobilized to mission and they are cheaper. They have less attachment to worldly possessions. And they don’t need much adjustment in working in the slums. 90% of the people in the church today are from the poor. The world has also changed so much. In my time, there were more people in the rural areas than in the cities. It is now the reverse. Millions migrate to the cities each year. There are now more people living in the cities than in the provinces. Most of these migrants end up in the slums because it is the only affordable place they can stay in. Slums are actually places of freedom. In India for example, the outcastes do not feel discriminated inside the slums. Outside, the upper caste will discriminate against them, often in violent ways like throwing acid on their faces if they cross the social line. But in the slums, the lower castes can marry freely the upper castes or even across religions, marry a Muslim or Buddhist. Women especially feel the freedom more all because there are more jobs for women and more high paying jobs. Slums make them open to the gospel and it is where most come to Jesus Christ. I hope Christians realize that the angels in heaven do not just rejoice when a rich man is saved, they also rejoice when a poor man is saved. We have to face the challenges of urbanization when millions migrate to the cities and alter the social and philosophical landscape of our cities. New York is no longer Caucasian post-modern, post-Christian city because it has more Chinese and other ethnic people, most of whom are animists. Their birth rate is also higher. The migrants’ birth rate in Amsterdam can be as high as 2.8% annually compared with the negative birth rate of the native Dutch. In a few years, they will all be overwhelmed by the sheer number alone of the migrants. Many caucasian evangelists, French, English, South African, moan the fact that it is so hard to evangelize Paris or London or Johannesburg, but it is because they never consider the overflowing migrant churches, which are full of non-whites, just a few blocks from where they live. As cities urbanized, crime rates will also go up, there are already some very widespread and violent riots in the past years in Paris and other European cities. There will be intense human congestion, more epidemics, shortages of hospitals, housing, schools, and water. There will be an increase in solid waste, traffic jams, and air pollution. Many will be tempted to flee. In America, in the last decades, we witnessed what was called the suburban flight when the rich fled the inner city to live in their safe suburbs. There is a movement now of the rich reclaiming the inner city, driving prices of housing sky high so the poor are once more driven to the wall of despair. The main challenges of urbanization are: what kind of cities are we building for God, and for our children in the future? The second challenge is, who will share the gospel to these migrants who crowd the cities by the millions each year? Will we just flee, will we just build higher walls, hire more security guards? Missiologists are still lost on this issue. I talked with some experts on this and it seems, urban mission is still largely a rich man’s affair. The goal of urban mission is to reach the wealthy and powerful in the cities, not the poor. One well known expert on urban mission even said, “of course, we will also reach out to the poor, so that our ministry in the city will have credibility.” He was implying that urban poor mission is only incidental to the mission to reach out to the wealthy. We need to bring urban poor mission to the front line. It is the cutting-edge ministry today. It should be, with millions migrating to the cities each year and most landing in the slums. Thank you for sharing your life journey………… I spend some very heart fullfilling years, working with mainly women and children in Dumaguete City, Negros Oriental. I was a very privledge european who worked together with filippinos and americans. All the work was possible, all the reaching out, the growth of dignity, of education, of health care, and sharing our love for God, to talk with words and action, the words of love of Jesus. Due to, that in the 80/90, we were able to reach the hearts of men and women in our own countries. This continues even today. The blessings were many, for us all. I believe that each country open their hearts for the less fortunate in life, (long or short term, hardship), in very diffrent ways. For us to reach out to each other, this needs to be respected, for us all to reach each other more and more in our hearts. Education for all, and step by step we will learn to reach out with love to one an other, where ever we happen to be born. Praise and not Fault giving is what Jesus is trying hard to teach us, each and every day. With loving care to us all…………….